Intense learning can be exhausting. Here are some tips to manage your energy and make the most of a long day of lectures. Click on the images for larger versions! Energy is the first part of the equation. If you’re not alert, you’ll have a harder time understanding and remembering important topics. 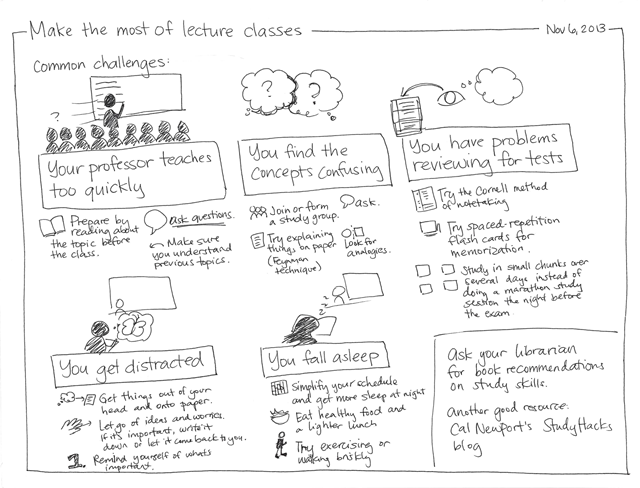 Okay, now that you’re in the lecture, how can you deal with common challenges? Here are some ideas. Review is where learning really happens. That’s when you fill in any gaps and connect what you’ve learned to what you need to remember and what you’ve learned before. 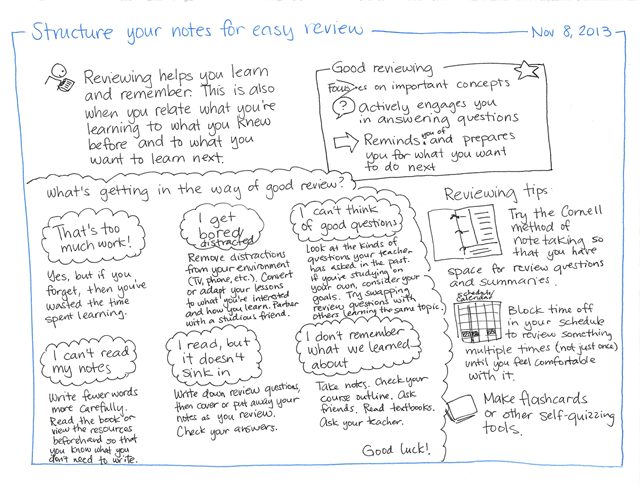 I’ve been trying to figure out how to improve my processes for reviewing my notes. 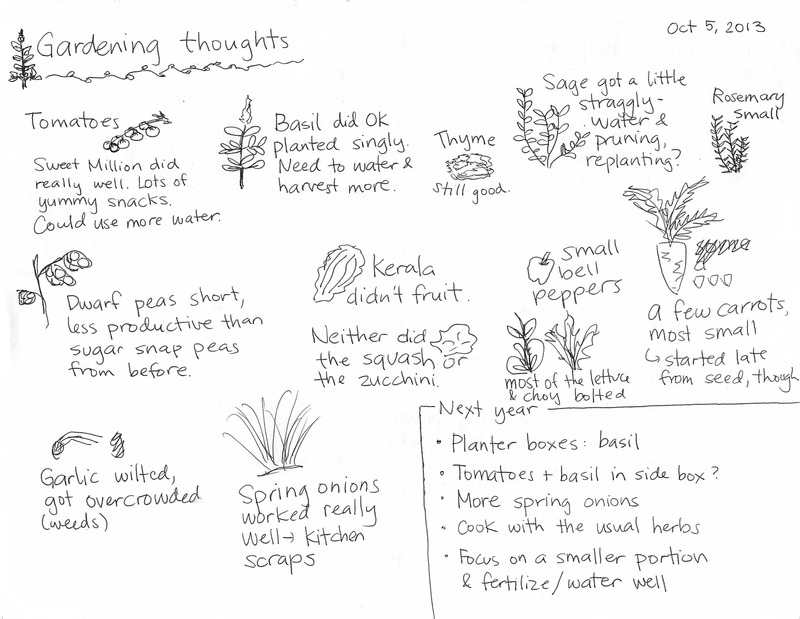 Writing things down and drawing things (more often now!) are great ways to remember, but imagine if I could get even better at keeping track of current information and digging up things from my archive. My weekly, monthly, and yearly reviews have been really helpful even for just the decade I’ve kept them. I think they’ll be amazing to extend over a lifetime. A. Open loops: I need to be able to review my notes for things I’m working on, especially if they go beyond a few pages or what my memory can hold. I can make this easier by keeping an index or map of things I’m currently thinking about so that important topics don’t fall through the cracks. B. Growth / review: I like reviewing how far I’ve come, checking that against my plans and thinking about what I want to do next. Progress is hard to see day by day, so records help. C. Topics I’m thinking about in depth, especially over time: I can simplify review by organizing things into larger and larger chunks, like the way that writing subroutines makes programs easier to understand and remember. In particular, I’m working on getting better at thinking about topics that are beyond what I can hold in my head (C). 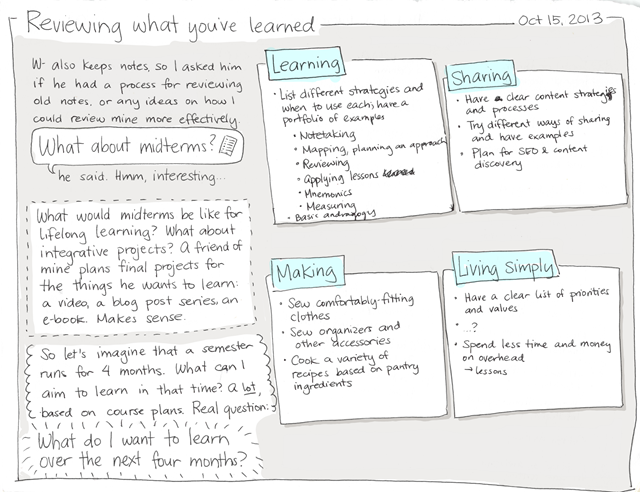 Combining mind-mapping with sketches looks like a promising approach, and making summary sketches/blog posts can help me chunk things better too. I also want to get better at tracking decisions so that I can review them 9-12 months later (or at a suitable review date), which is one of the tips from Peter Drucker’s Managing Oneself (see my sketchnote). I’ve posted decision reviews before, but it would be good to make the process more reliable. Making decision analysis part of my daily drawing practice will help with documenting larger decisions, and then I can use Evernote or Org reminders to schedule the review. 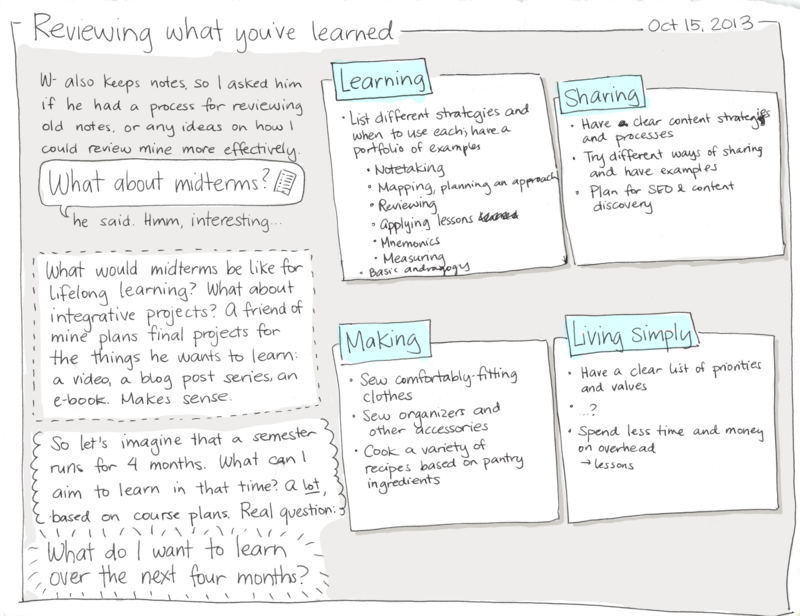 Reviewing what I’ve been learning can also help me see what I want to learn more about next. If I can keep my main topics in mind and focus on exploring subtopics that are near those, then I can take notes that are more useful for myself and other people. It’s different from a scattershot approach because it lets me build up more competency or understanding in different areas, and it’s different from a tightly focused approach because this way I don’t overspecialize or get bored, and I can play with the connections between ideas. Most of the note-taking tips out there focus on school, of course. I wasn’t sure how useful those tips would be once you’re done with exams and final projects, but they might be handy after all. It’s easy to convince yourself that you know enough about something, but the real test is using that knowledge to do something new or become someone different. How will learning something change me? What will I be able to do? In addition to learning something from the way school structures reviews, maybe I can learn from people who have kept journals for decades, and authors who do extensive research (maybe nonfiction books in the same area?). 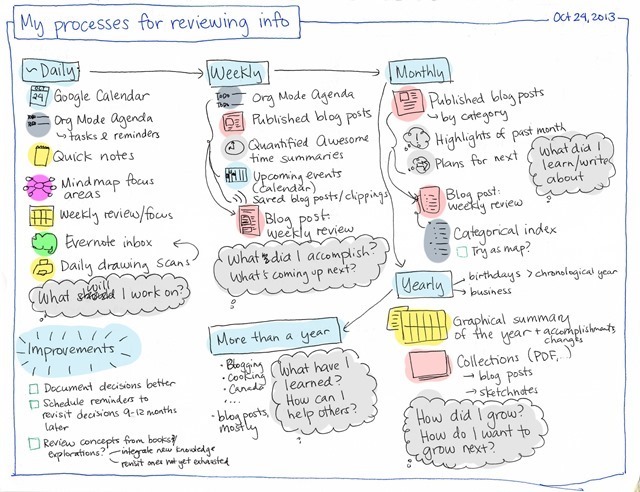 I’d love to learn more about how prolific note-takers organize and review their information. I’m not interested in perfect memory or people for whom this is easy. I’d love to learn from people who have thought about it, tried different things, and found ways that worked better for them. Thoughts? When I started my experiment last year, leaving the familiarity of web development at IBM for my own adventures, I wanted to dig into several big unknowns that I had little experience with: the paperwork and accounting required for business, and the sales and marketing that’s even more crucial to business survival. I had tracked my personal finances and prepared our taxes for years, but business finances were new to me. I’d loved reading sales and marketing ever since I could clamber up my mother’s bookshelves, although my understanding was still abstract. So I expected to do favourably, but I was still a little nervous. After all, this was one of the key differences between an independent life and one inside a company. My experiences with this would determine whether I could survive on my own or whether I’d do better within a structure built by someone else. Would the benefits of managing my own business outweigh the overhead? Would the experiment be a long, hard slog, or could I get the hang of the fundamentals? Accounting and paperwork was the first hurdle. I wanted to incorporate right away to have that separation between me and the company, so that any mistakes I might make wouldn’t bring us all down with it. It was probably unnecessary, but it was good to know that as long as I paid attention to the details, we’d be okay. For the most part, D.I.Y. paperwork has been sufficient. I filed my articles of incorporation online, registered my company with the Canada Revenue Agency. It took me a while to sort out getting a business credit card, but it was straightforward once I did so. There were a few stressful evenings of forum research and fact-checking on government websites, such as when I decided to cancel my cellphone claims and ended up owing additional taxes. (It turned out to be just a few dollars’ worth.) Reading entrepreneur forums like the ones at Red Flag Deals helped me watch out for common pitfalls, such as the installment payments that automatically kick in after you reach a certain income tax threshold. I’m still postponing the paperwork needed to figure out how to get money out of the company. One step at a time. I’ve grown to like that separation of saying, “This contract is between your company and my company,” or “The business will invest in buying ____.” It forces me to make decisions: is this worthwhile for the business? I have a trade name now, although I’ve kept the main company as a numbered company so that I can stick all sorts of other experiments underneath it. If I were to do it again – or even now – I’d love to have an accountant whom I could e-mail questions periodically. I’d still want to keep a close eye on my books, and my transaction volume is low enough that I can handle things myself with Quickbooks. It would be good to have someone doublecheck things, though, and answer my questions. One of the things that makes it easier for me is knowing that this too is an experiment, and that I can start up a different company with a different structure in order to try out other things. I don’t have to get everything gold-plated the first time around. That’s the paperwork and accounting part of the business, which is usually a thorn in people’s sides, but which has turned out to be doable and even a fulfilling Friday afternoon routine. Sales and marketing were other parts of business that I’ve heard many fellow geeks gripe about, so I wanted to find out what both of those were really like. Most freelancers I know have their plates full with referrals and repeat clients, and many don’t actively sell their services. I was lucky to have had clients for consulting and contracting right away, thanks to personal networks and my blog. In the past few months, I’ve been making myself scale back consulting so that I can force myself to learn more about sales and marketing. Digital conference sketchnoting gave me a great excuse to try it out. Sketchnotes are visual. People have built businesses around this before. Businesses have bought services like this before, although generally in other cities. The sales approach would be to reach out to conference organizers and event agencies, while the marketing approach might involve posting sketchnotes and resources for organizers. Illustration is a complementary service, too, and there are other services I can cross-sell. I like the process of mapping what I can provide (based on my own skills or including others) to what could create value for people. I like negotiating: cutting out the non-essential, adding options that people are curious about, and finding creative ways for everyone to get what they want. I like coming to an agreement on value and deliverables. I like receiving cheques and depositing them. I’m even fine with following up and with turning down clients. Sometimes there’s a better fit elsewhere. My marketing has been a gradual process of building up my website and sharing more resources. I enjoyed designing a logo and thinking about how to explain what I do. I’m glad I can build my own website and tweak it based on the ideas I have. New entrepreneurs are usually advised to outsource web design and development, but I think there’s value in creating my own simple site and evolving it over time. There’s still so much more to learn. Looking back at this first year of my experiment, I think that the overhead of building my own business has been more than worth it. Many people see paperwork, sales, and marketing as distractions from the fun stuff, the work that they actually enjoy doing. For me, these activities are like programming, although in a slightly different form. It’s like learning more about the APIs (application programming interfaces) of the world, exploring the standards and specifications to find out what’s required from me and what’s possible. It’s like developing procedures, dealing with bugs, and improving algorithms. It’s like playing around with an interface until you figure out something that flows. I’m glad I started this experiment. It’s difficult to imagine a career path within a company that would shift me from development (which I’m good at and which I still enjoy) to learning more about sales, marketing, and finance (which I’d have no qualifications for, and which I’d probably be terrible at in the beginning). It isn’t optimal. It doesn’t make sense. On my own, I can make that decision to temporarily give up some productivity in favour of building a useful combination of capabilities, and then see where I can go from there. I am less awesome a developer than I could have been if, say, I’d spent a year intensely working with Rails in a boutique web development agency, but this combination of tech and business and creative and communication will probably come in handy someday. I think this will give me a great foundation for further experiments. I spent the first year of my experiment learning that it’s not that scary to create something and get to the first sale. I’d like to spend the next year getting even better at taking a business from the sparkle in one’s eye to a prototype that people can look at, sign up for, or buy, learning more and more about de-risking ideas. Then three years to see what I can do with those skills, and then my first evaluation: back to the world of other people’s ideas, or onward with developing mine? Have you ever felt unsure about whether you’re moving forward or where the time went? A friend called me up and asked for help on being able to see the progress in her life. I walked her through the process of doing a weekly review using a Google Docs document. A weekly review is really simple. Write down the dates you’re talking about, and then write down what you did. Look at your calendar, e-mail, and to-do list for hints. Don’t worry about pinning things down to a specific day; just write down what you remember. Set yourself a reminder to do this again next week – it might be a calendar appointment, it might be an item on your to-do list. Lather, rinse, repeat. When she got to the end of the things she remembered about last week, I asked her some questions about relationships and life, and we turned up quite a few more things to celebrate. She was surprised by how long the list was. People do a lot, but it’s hard to remember what you’ve done. You make progress an inch at a time, and you don’t see the miles. I can remember about a week back, and that only with the help of my notes. Any further back, and I know I’ll be missing important things. I write so that I can remember. 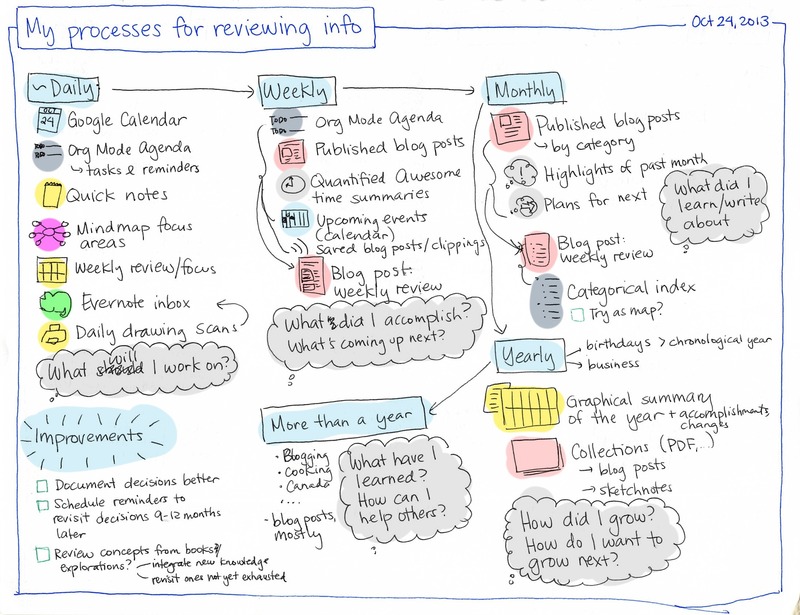 Daily blog posts roll up into weekly reviews, which roll up into monthly and yearly reviews. I can tell you where the last ten years went: where I’ve gone forward, and where I’ve lost something along the way. It’s good to celebrate the little wins, though, and that’s part of why a weekly review is so useful. We forget where life goes. It’s also good to see the gaps, to come a little closer to what you really want. Writing down your ideas for the next period keeps you from forgetting. You can move away from the plan, especially if other opportunities come up, but the plan is a useful default. I also regularly look forward. When I analyzed the phrases I used on my blog in 2012, “I want to” and “so that I” were my top two phrases. I write about what I want to do. I mindmap and draw my ideas. This looking-ahead is part of my regular weekly, monthly, and yearly reviews. Thinking about the future pulls me forward so that I don’t get stuck in the past. It makes the present more vivid, more real. January is named for the Roman god Janus, the two-faced god of beginnings and transitions (or at least that’s what Wikipedia says he is). He looks towards the past and the future, and so do we. I was in California for two weeks: three days at a conference, a 5-day impromptu road trip to Disneyland in Anaheim, and a few days of hanging out at my sister’s or in San Francisco. Typing lots of notes from the organizers’ session: I used Google Docs to quickly type in and share my notes from the Quantified Self 2012 organizers’ meeting. Quite a few people came up to me and thanked me for the notes, including people who came in late. We didn’t have a projector, so I put the URL by the nametags instead. 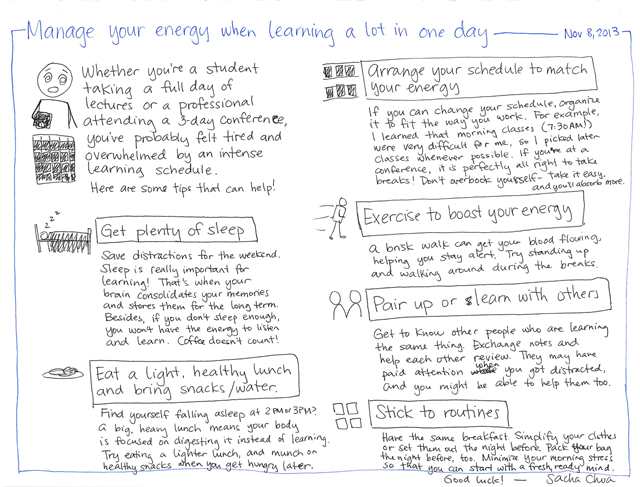 The plenary sessions were fun to sketchnote, and it was great to be able to publish them straight to the conference blog (opening day 1, opening day 2, Ignite talks, closing) using my laptop. For the most part, the hour-long talks fit neatly on a single page. Awesome! Vibram Five-finger toe shoes: Excellent for lots of walking during the conference and in Disneyland. No blisters or sore feet, and I didn’t have to wait for socks to dry. Columbia zip-off pants: I turned these into shorts for Disneyland, which was great because there was a ton of running around in hot weather. Anker external battery: Great for extending my phone’s battery life. I didn’t run out of juice during the trip. Travel socks instead of cotton socks: Cotton socks take a long time to dry and are stiff after being hand-washed. I should have brought my Tilley travel socks to pair with my sneakers instead, as those dry overnight. Didn’t use my tablet at the conference, but I brought it on the road trip: I bought the TF700 thinking I’d use it at conferences thanks to its longer battery life, but the Lenovo X220T lasted as long as I needed it to and I prefer drawing on the X220T’s screen. I like using the tablet at meetups around town, though, because that way I don’t have to bring my laptop. Sketchnotes on my X220T feel more polished because I have better drawing tools, but if I get used to using the tablet (maybe sketchnoting webinars?) or tweak my tablet style, then I might use it more often. The tablet came in handy on the road trip, though. My sister gave me a small bag to pack things in, and the slim tablet fit with my clothes much better than the laptop would have. Didn’t use the tablet dock at all: I thought I’d use this to give myself more battery life during the conference, but I ended up just using my tablet PC instead. Didn’t meet up with many people: It was difficult to coordinate small get-togethers. I made it out to see a small bunch of Emacs people (who are awesome! ), but that was about it. Part of this was because plans were up in the air. Maybe next trip, I’ll pick one or two days and focus on meeting people then.